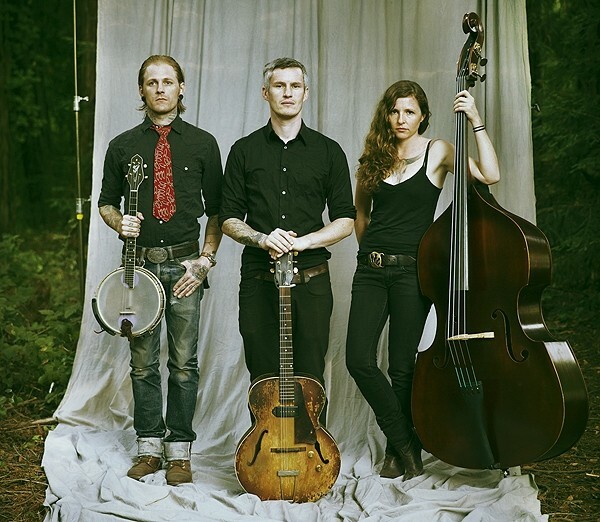 You don’t have to be a church-goin’, God-fearing soul to understand the Christian themes depicted in roots/Americana trio The Devil Makes Three’s latest album, I’m a Stranger Here. The age-old struggles between good and evil and light and darkness, the cycles of death and rebirth, and the hard scrabble from self-destruction to redemption are applicable across all belief (or disbelief) systems. “The stories in the Bible are some of the oldest stories that we have in America, and they’re stories that everyone knows,” says guitarist/singer and primary songwriter Pete Bernhard. Born to a family of musicians in Vermont, Bernhard grew up on a wide variety of excellent music: Woody Guthrie, Bob Dylan and Lightnin’ Hopkins from his dad; Southern music from his brother who moved to Nashville after graduating from Berklee College of Music; and the Rolling Stones from his sister. Gospel music, however, grabbed hold of him and never let go. The songs on I’m a Stranger Here—the band’s fifth album, released in October 2013—sure ain’t spirituals, though. Bernhard might be singing in his twangy voice about Jesus and the afterlife and saying “hallelu!” a lot, but it’s all clouded with classic Devil Makes Three darkness and irreverence. After all, this is the guy who dispensed the advice “if you’re gonna do wrong, buddy, do wrong right”—from Do Wrong Right, released in 2009—and is wont to sing about graveyards and demons. Darker stuff is “sort of what I’m drawn to write about and what I find interesting,” Berhnard says. Death comes creeping in “Dead Body Moving”—which Bernhard says is about “reincarnation but also just death in general”—especially in the lyrics “My body’s weak but this soul is strong/ I am a shadow dressed up in this skin and bones.” Darkness of a more earthly nature—addiction—is the focus of “Mr. Midnight,” which is, sadly, about “a pretty close friend of mine who’s just never really been able to shake a really bad addiction,” Bernhard says. The album’s gritty subject matter is wrapped in raw, mostly acoustic instrumentation, with bassist Lucia Turino and guitarist/banjoist Cooper McBean completing the trio. The Devil Makes Three’s unholy blend of blues, mountain music, punk and country (“We always jump genres,” Bernhard says) gets touches of jazz and even surf on I’m a Stranger Here, courtesy of the renowned New Orleans-based Preservation Hall Jazz band and album producer and guest baritone guitarist Buddy Miller. Fiddle and piano lend melodic richness, and there’s even some percussion, a first for the notoriously drum-less band. Bernhard attributes the album’s full, diverse sound to the fact that the band chose to work with a producer for the first time, as well as record in an actual studio instead of at home, at Dan Auerbach’s (The Black Keys) studio in Nashville, Tenn. “We tried a lot of stuff on this album that we haven’t tried before,” Bernhard says. I’m a Stranger Here, arguably the band’s best release yet, also shows the progress the trio has made since coming together in 2002. “We’ve just improved as musicians over the years,” Bernhard says. Wednesday, Jan. 22, 8:30 p.m.